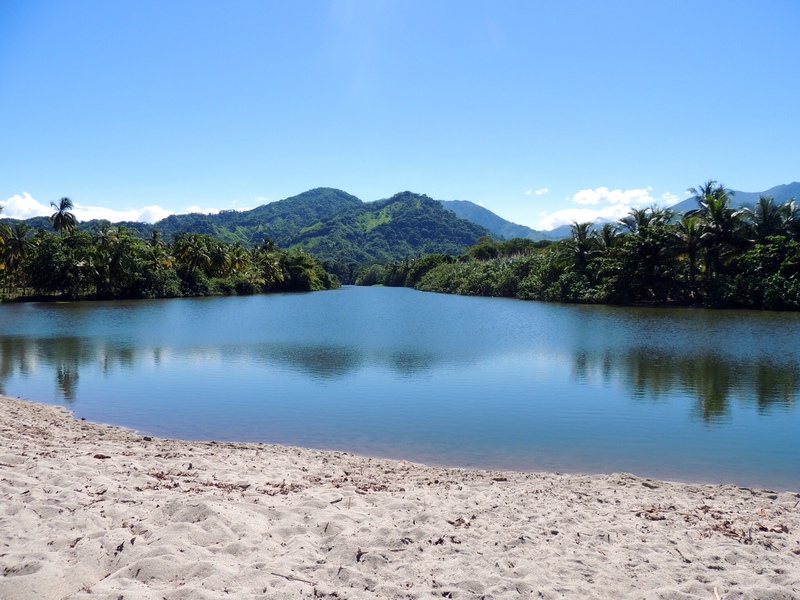 Where the river and the jungle meet the sea: Costeño beach, Colombia. 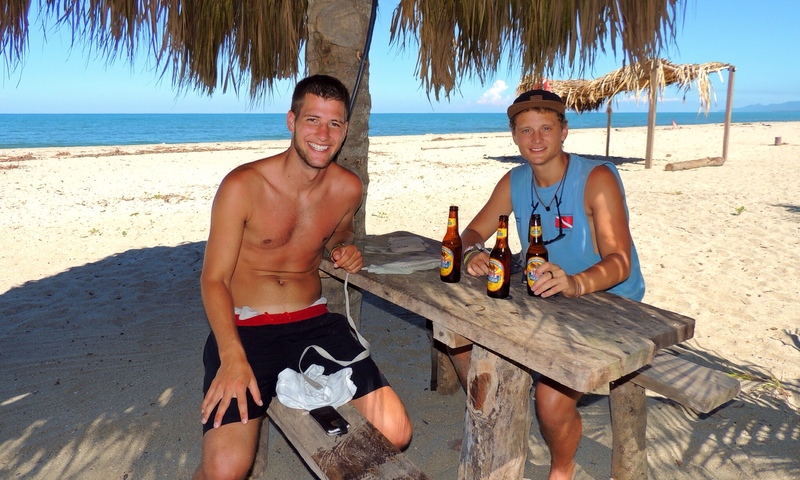 We had been in a perpetual state of relaxation since finishing our three day diving course in Taganga. The three biggest (and most convieniently located) pleasures in life, a beach, a beer shop and the relentless sun, had not stopped rewarding us for doing pretty much nothing for the last few days. The strange thing about hammocks is that, despite their never-ending capacity for comfort, a few days spent horizontal in one of these wonderful contraptions brings on a building sense of guilt. It was time to go and lie in a hammock elsewhere. ‘Gumma’, a wiry little Aussie with a tight head of blonde baby curls and an endless supply of grinning energy, convinced us that he ‘knew this place’ that we could all go and hang out for a couple of nights to get away from the lives we’d all become so accustomed to. He made this monologue while standing awkwardly on a concrete table at 2am, beer in hand, pausing only briefly to shout, “Teddy’s only gone and blown a plugga!“, as I stood up and my thongs burst open with excitement. Somehow, by only what can be described as a miracle of God, myself, Torby, Dominic and Gumma were standing shoulder to shoulder the next morning, day packs at our feet and ready to move out of the place we had come to call home. By something of a blur we managed to board a typical Colombian bus (thrice as many people as seats, lunatic at the wheel) and we were wheedling our way around the northern coast, east towards Costeño and along the Colombian equivalent of Australia’s Great Ocean Road. The ‘surf hostel‘ that we were heading to was advertised in that awful drippy 70’s style hippy font that somehow became so popular in the 90’s, leading me to wonder ‘how cool could this place actually be?‘, as we trudged the last couple of kilometres through a field reminiscent of the massacre in ‘The Beach‘. I was confident that our lives were going to be ended at any moment by a semi-automatic wielding Colombian bursting from the greenery. Five minutes later, Torban (who obviously didn’t share my enthusiasm for such morbid thoughts) discovered a coconut tree and devoted the next twenty minutes of his life excitedly throwing rocks at it in order to dislodge a fruit for himself. I watched on from a distance, not necessarily in fear, I just knew I couldn’t throw a rock that high. Finally, we wandered into the surf camp. To my dismay, I immediately realised that every male and female present were at least a foot taller than me, three shades darker and 100 percent more muscular (where do they get those from?!). Despite having walked into some sort of unannounced beauty contest, I managed to hold my own as we watched our first Costeño sunset. The next day we wandered almost as far along the beach as we could, past various fishermen and their boats, interrupted only by palm trees and the sound of exotic birds. We paused for a cold Aguila at another beach surf hostel and crossed the river (I forget its name) where it met the ocean. Driftwood sprouted from where the tides left it to rest and at certain points all but a narrow sand dune separated the ocean from the river, set against a magnificent landscape of the tropical jungle making up Tayrona National Park. The photos from this amazing part of the beautiful Caribbean coast are in the gallery below. Enjoy!